« 4.1 SQ Podcast 9 – Keep Experimenting Everyone! This is the way I have done the music portion of my podcast. This tutorial uses Mevio’s Music Alley and Audacity because that’s what I use. 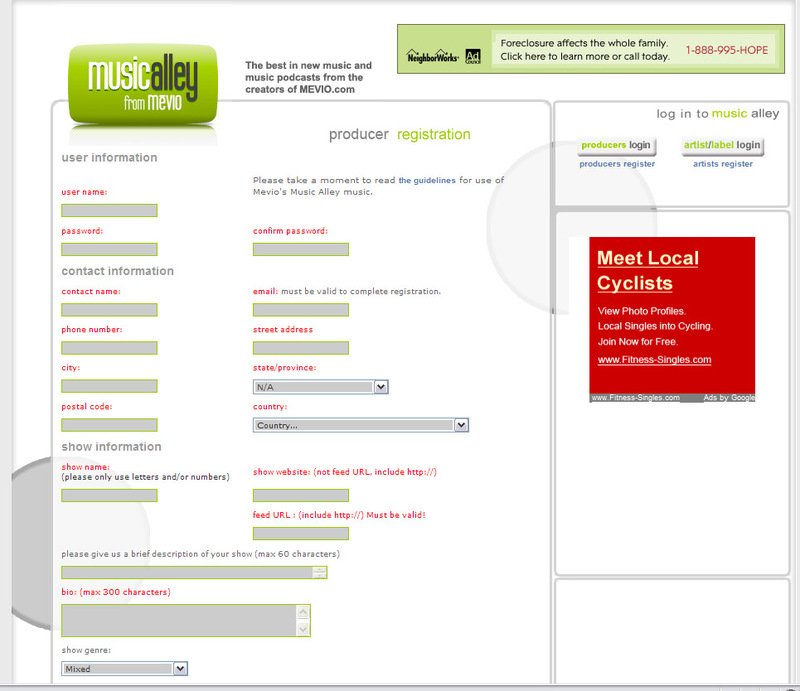 Both are free to use, and be sure to read the guidelines they have for each site – particularly Mevio’s Music Alley. For more detailed info on how to start up a podcast from a quilting podcaster’s perspective see Allison Rosen Episode 53 and show notes. I also said something about creating a podcast in a previous post. 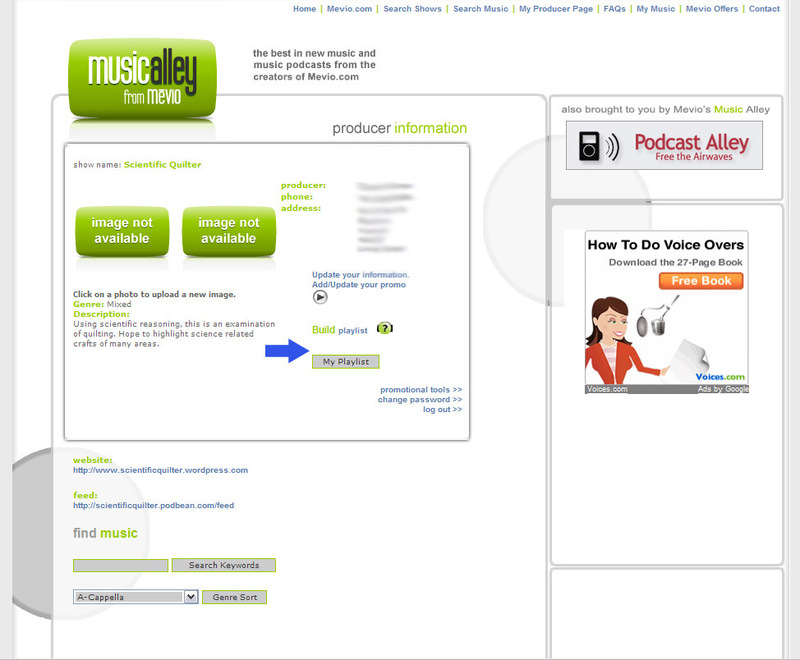 Using Mevio’s Music Alley for Podcast Safe music first requires you to have an e-mail address, website, and a feed address for your podcast hosting site. Let’s assume you’ve done all of this already. We also ask that you link back to Mevio’s Music Alley in your show notes for those shows that include music from this site. http://music.mevio.com. I have a permanent link in my sidebar with the Music Alley link and I state in my podcast outro that the music is from mevio’s music alley. So make sure you plan to do this as well so that the artists can get credit for their work. If you’re starting a podcast, you’re considered a producer, so if you don’t have an account you have to register. Otherwise use the producer login button. View of the registration form. Check the guidelines here first as well. You may have to go check your e-mail and come back at this step. I’ll wait. You need to build your playlist to find your songs you want to use. Click build playlist. You can do a search in the search function, or look at genres of music. The Listen here button is where you can play songs. The blue background is the amount of the song downloaded, take time searching & browsing and find a good song for you. If you’re logged in you have an add to playlist option. Click here to get the song available for download. You’ll get a popup and you want to add to the playlist. When you’re ready, go to my page for downloading. Then go to the My Playlist button. Click on the download mp3 and save the file on your computer somewhere. How do you incorporate this music into Audacity for making music fit for your introduction? Let’s see. Import Audio option in Audacity. Chose your file. Highlight the beginning of your music. A few seconds will usually do. The shorter time highlighted the more sharply the music will fade in. How much you highlight will depend on your own style preference and music type. Choose the fade in option under effect and the audio will go from zero to the current volume. Neet huh? What if you want to record over a section and the current volume is too loud? Highlight the section you want to record over, then chose effect amplify, and then put in a negative number. There’s a handy preview button in the corner for you to critique yourself. Start your cursor in the faded section and start recording. You can always adjust the time your audio clip starts by clicking on the double arrow tool and dragging your audio around. Delete the part of the audio in the back you don’t want (highlight and delete) and don’t forget to go to effect fade out at the end. Once everything is set in place, export your file as a wav file instead of an mp3. In my opinion, mp3s compress things too much to get good sound quality on something you use over and over in your show. Don’t forget to save changes to the project file in case you want to make changes later. Then when you need the intro in your show, before you start recording, just go to project/import audio and start recording new stuff at the back. Brye starts her intro with her own voice and then fades into music, as well as Allison Lee. Jennifer and Allison Rosen start with music first, Kelley doesn’t have any music and that works well for her, Michele starts with her kids’ recording, very cute. How do you setup Bumper music? What about my bumper music? How did I achieve that? My bumper music is still part of the song Science vs. Romance by Rilo Kiley. I was very fortunate enough to pick a song I liked as well as a song that has a lot of instrumental parts (yes there are words to the song) in addition to the amazing title and how it fits my entire blog theme. Here is a picture of the audacity bumper music project file. I don’t have pictures of the entire process of how I got to this place step-by-step but I can outline steps below. Open up the song (import music) I want to include for bumper music. Highlight a 5 second section of the music and go to the option Edit/split. Repeat for all the 5 second sections I may want to have in the show. Grab the first 1 second of the clip. Repeat for all the bumper music sections. Save the project at this point as something so you can go back and make changes. Export as a wav file (see above). I just have the entire bumper music file saved and import the entire file each time and delete the part I don’t want. If you desire, it may be easier to save each individual blip separately. Any questions please ask. Glad to be of help. Could I ask someone to help me and tell me if episodes 1 & 2 are showing up in iTunes for you? I already have the episodes downloaded and so I want to know what this “archive thing” on podbean does. Thanks a bunch!